Lend classic style to your landscaping using this Achla Graphite Aldrich Trellis with Side Panels package. 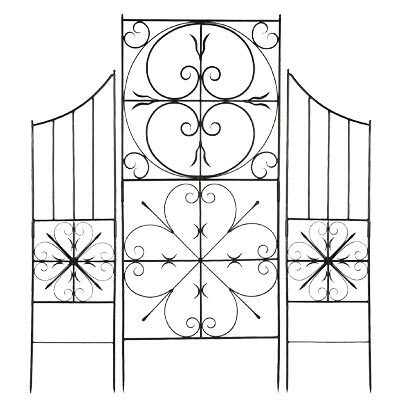 This wrought iron trellis and panels set is perfect for creating a screen or dividing the space in your yard, while the intricate scrollwork adds drama. The rectangular shape of the Achla Aldrich Trellis contrasts its wealth of interior curves and curls, and the varied patterns on the included Achla Aldrich Side Panels further this unique look. Stand these items in a row by inserting the legs of each piece into soil for a lovely screen or plant support, or angle the side panels to define a corner. For added versatility, use these pieces around a pool filter or air conditioning unit to keep it inconspicuous in your landscaping. The powder coated finish on each unit keeps them beautiful for many seasons, while the graphite color enhances virtually any setting. Create a fantastic focal point in your garden using this Graphite Aldrich Trellis with Side Panels package. Assembly required.